To be a proper blog, the photo must be blurred and amateurish. The AUC translators series, which hosted its third speaker last night, invites interesting comparisons. 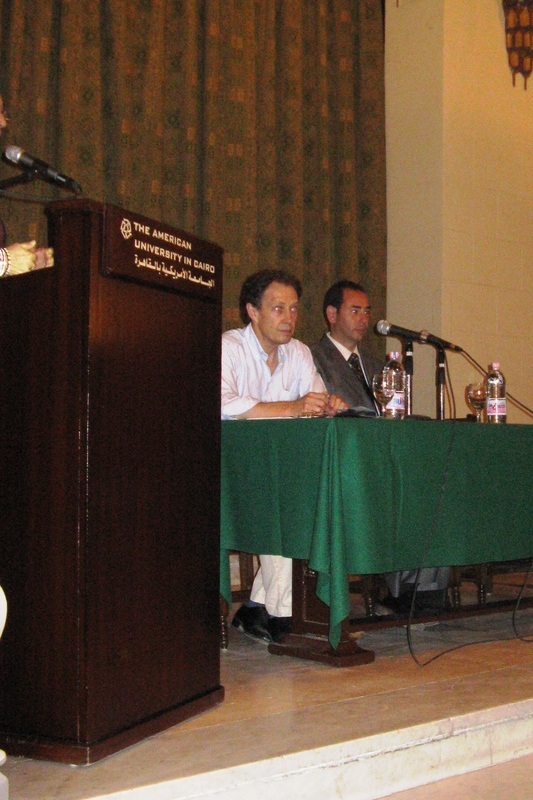 Journalist and translator Jonathan Wright spoke yesterday at the university’s downtown campus, addressing issues of translation alongside the first author he’d translated, Khaled al-Khamissi. Wright addressed translation in a very different manner from Humphrey Davies, who spoke in the AUC series last month. Interestingly, both Wright and Davies have argued that they don’t have a literary voice when they translate, but instead try to speak with the voice of the work. But from that point of agreement, Wright established himself as a very different sort of literary translator. Whereas Davies talked at length about a love of books and language, Wright described much of his career as that of a straightforward working journalist, when he “didn’t think much about” the translation he did. Wright said that he hadn’t intended to work in literary translation, but when he came across Khaled al-Khamissi’s best-selling Taxi, it was at a time when journalists were gabbing a great deal about the Arab street. Taxi seemed like a book that would address this (perhaps “forensic“) Western interest. Wright’s long history as a journalist certainly has shaped his take on translation. His attitude seemed far more “get it done” than some of Taxi‘s other translators. Author Khaled al-Khamissi described the Italian translator, Ernesto Pagano, as rendering literary (fos’ha) Arabic in a more classical Italian, wheras the colloquial dialogue (a’meya) was written in Neapolitan dialect. At times, al-Khamissi and Wright disagreed—particularly about the possibilities of “literal translation,” which Wright defended—and at times Wright seemed to disagree with himself. At one point in the evening, Wright spoke quite eloquently about how what an Arabic-English translator needs most is not perfect fluency in Arabic but “what you have to learn most is how to use English.” He spoke of leaps of the imagination required when there is no good semantic overlap; for instance, he found no “exact” word in English for an Arabic term describing the sound of a grinding millstone. He said he just had to imagine for himself the sound a millstone makes as it turns. It will be interesting to see his translation of Yousef Ziedan’s dense and philosophical Azazeel; unfortunately, Atlantic says they won’t have it out until the summer of next year. I am Humaira Nazeer from Muslim family and I have completed my all Islamic study from IslamicInstitution of Toba Tek Singh . Today I have visited your website.Its realy wonderful work.I have desire to become the part of your Organization . I am able to do translation work.If you have translation work this is my request kindly contact with me. I am able to do Translation and recording work in some Pakistani Languages. Our National Language is Urdu and some other Provinces Languages. I do Islamic Translation work in Low and proper rates in Urdu, Punjabi , Sindhi , Arabic and Saraikie.I am also able to do Recording work. I see on your site that you have working on different Languages in different countries. Hopefuly you will Contact with me soon. I find this article very interesting, especially as I am currently working on a scientific paper entitled THE INTERFACE OF JOURNALISTIC TRANSLATION AND LITERARY TRANSLATION.